Sana Dental in Edmonton, AB is here to help all patients in Edmonton achieve a healthier smile through preventive dentistry care. Preventive dentistry is the most important form of dental care which is why we want to educate our patients about the importance of preventive dentistry. It is with preventive dentistry that you will achieve a healthy smile and avoid serious dental problems down the line. Find out about the importance of preventive dental care and what you can do to step up preventive dentistry in your life. When it comes to preventive dentistry, doing your part at home is half the battle. We advise our patients to brush and floss their teeth twice daily. Our Edmonton dentist also recommends eating a diet that is low in sugary foods and drinks. If you do find the need to eat a dessert or drink a sugary drink, make sure you rinse your mouth with water afterward or brush your teeth if possible. When you eat or drink something sugary, the sugar mixes with the bacteria in your mouth and this causes a chemical reaction that can cause cavities and dental decay. It’s important to remove this sugar from your teeth in order to prevent yourself from stuck on plaque and tartar. In addition to eating healthy, we recommend that our patients choose a toothbrush that has been recommended by the ADA. If possible, go with an electric toothbrush instead of a manual toothbrush for better cleaning power. Lastly, you can take care of your teeth at home by using a fluoride mouthwash. The fluoride mouthwash gives you extra protection against cavities and fights bad breath. At Sana Dental, we recommend our patients visit us every 6 months for their complete dental exams and cleanings. 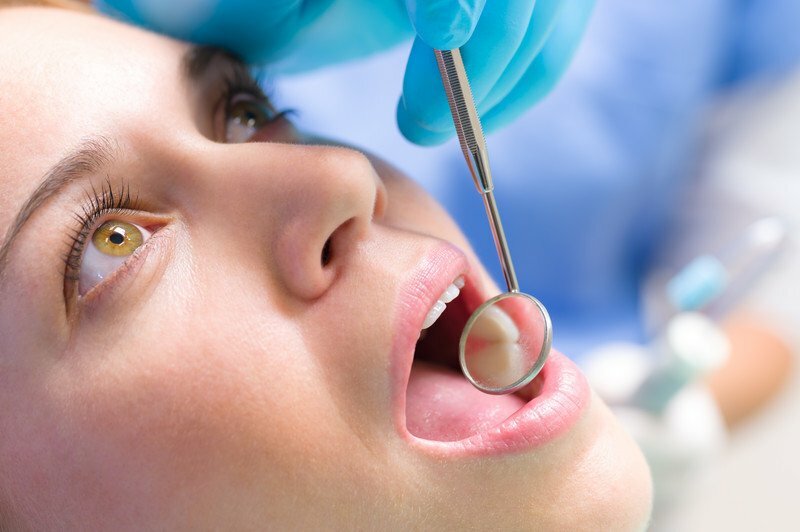 During these visits, we take a look inside your mouth to find any underlying problems as well as give you a deep cleaning to remove all plaque and tartar. First, we will take x-rays. These dental x-rays give us a look at what’s going on inside your teeth. This helps us find problems that we normally wouldn’t be able to find with the naked eye alone. Afterward, we will inspect your smile for any problems that are visible to the naked eye. From there we can evaluate if you need a cleaning further than a regular cleaning. We will also inspect your gums and keep an eye out for any suspicious spots in your mouth that might indicate cancer. After inspecting your mouth, our Edmonton dentist will use a dental instrument to scrape away plaque and tartar and to remove any from under your gums. After this, our hygienist will give you a dental cleaning and a fluoride treatment if you wish. Our dentist will let you know if there are any problems that need attention and any additional preventive procedure you can benefit from. In addition, he will also let you know if your at home care needs improving. One of the top preventive dentistry treatments we can recommend for our patients is orthodontic treatment. Although we cannot provide you with braces or Invisalign in our office, we can recommend an orthodontist to complete your treatment. When you avoid receiving an orthodontic treatment, many problems can arise in your mouth. When your teeth are gapped, crooked or misaligned, you can experience a bad bite which can lead to uneven wear of your teeth. It can also cause TMJ, bruxism or even sleep apnea problems. In addition, patients who have crowded and crooked teeth regularly experience decay and tartar in hard to reach spots. It’s hard to reach these spots when brushing or flossing. Receiving an orthodontic treatment can help you prevent all of these problems from occurring. When you have a condition like bruxism, it’s important to take care of it with preventive dental care so that you don’t experience further dental issues. Without treatment or care, bruxism can lead to broken, cracked, or ground down teeth. This can lead to expensive treatments like dental crowns or even lead to you needing teeth pulled. With a simple treatment like wearing a mouth guard while you sleep. This will prevent you from damaging your teeth at night from grinding or clenching. Like night guards, mouth guards exist to protect your teeth while you play contact sports. If you get hit in the face, it will most likely damage your teeth. By wearing a simple mouth guard, this will protect your teeth from painful damage that is expensive to treat. Lastly, preventive dentistry can include TMJ treatment. TMJ is a disorder that occurs in your jaw that can cause pain when it comes to opening and closing your jaw. Treatment options can be a simple oral appliance that you wear at night. TMJ can cause headaches and migraines, jaw pain, neck pain and more. Through treatment, you can avoid these painful symptoms. One of the top reasons you need to know about the importance of preventive dentistry is to not only maintain good oral health but to help your wallet from suffering major losses. When you let dental problems grow instead of visiting us every 6 months for preventive care, you face suffering from painful problems. These painful problems can eventually take a toll on your health and force you to visit our Edmonton dentist for a procedure. Unfortunately, when dental problems grow, they will lead to expensive procedures like root canals and dental crowns. To avoid these costly procedures, it makes the most sense to pay us a visit every 6 months so we can ensure everything in your mouth is healthy. If it’s been a while since your last dental exam and cleaning, it’s time you paid our Edmonton dental office a visit. To schedule your next cleaning and exam, give our dental office a call or fill out our online contact form. One of our staff will help you schedule your next dental exam and remind you when it’s time to visit us again.